Came across this recipe originally in a few BGE cookbooks, but finally found a site that posted not only a photo but their settings on the BGE as well. Must try this one! Roll dough into approx. 12″ x 15″ rectangle. Cook sausage. Mix cooked sausage, shredded cheese and eggs. Spread mixture on bread dough. 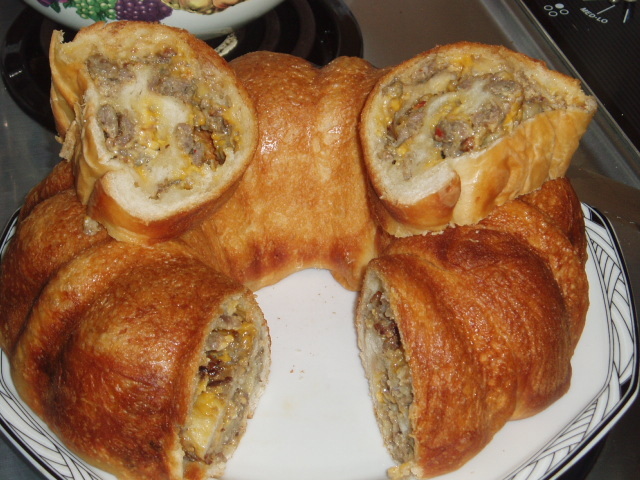 Roll dough with mixture inside like a jelly roll and drop into a greased (Pam spray works also) bundt pan. Let rise in warm area until puffy (about 1 hour). We quite often do the prep and assembly the night before and leave in the bundt pan in the fridge, covered with a wet towel to keep dough from drying. The next morning take the bundt pan out of the fridge before starting the Egg. By the time the Egg is ready and stabilized the dough has warmed up and risen some.